There’s no arguing crepes are a popular food. However, people are passionate about their favorite fillings. Here’s a variety of options sure to satisfy. 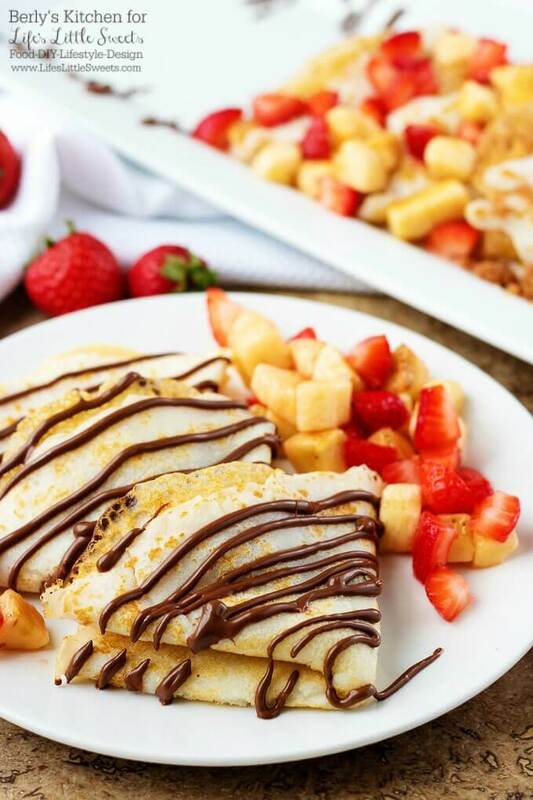 Crepes have been a household favorite for many years. With that being said, we just started eating them for breakfast. In the past, we always had palacsintas. If you’ve never heard of them, I recommend giving them a try. Getting back to our recipe, I used an easy crepe batter recipe. Kim came up with three different toppings so everyone could enjoy the dish. The thin pancakes are the only tricky part of the recipe. The toppings are easy-peasy to whip together. 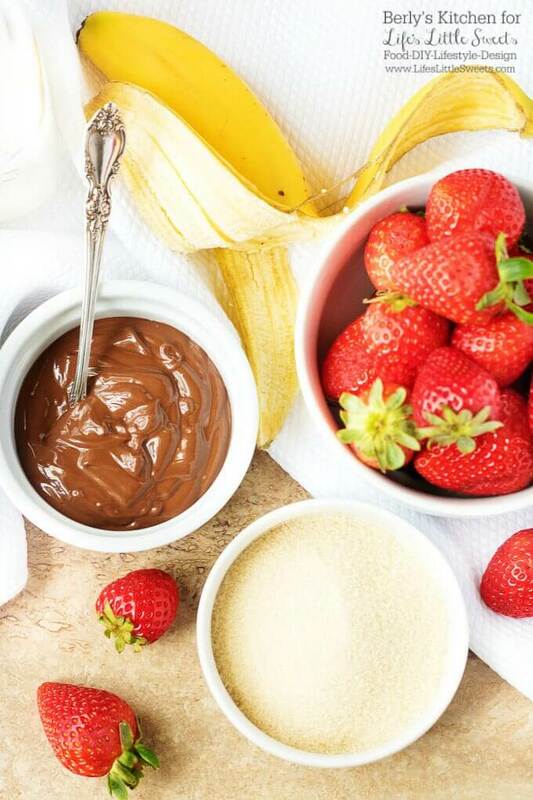 The Nutella topping is made by microwaving the sweet treat. Making the crunchy butter and sugar garnish involves cooking the mixture down until the butter browns. Finally, the banana and strawberry compote is made by tossing the fruit with a little lemon juice and sugar. If you have someone helping you, then the whole recipe can come together in well under an hour. All that’s needed is a little patience when cooking the crepes. Speaking of which, I have a few tips to help you create this fantastic French breakfast cake. First, make sure the batter is thin, really thin. Use the recipe as a guide, but please add more milk, a tablespoon at a time, if the mixture seems too thick. Next, preheat your griddle or skillet. We’ve found if the pan is too cold, the crepe will stick. Last, let the first side cook until the top side is almost done. You should only need to cook the top side for about a minute once it’s flipped. These little cakes can be delicate to work with, but when done correctly they have an amazing, chewy texture. Also, feel free to add some seasonings to the mixture, but don’t go crazy. Remember, cooking involves a certain level of chemistry. Meaning, the ingredients react to each other in a specific manner to create the perfect dish. As you can see from the photos, these crepes are so colorful. Additionally, the texture differences between each type of garnish provides your family with plenty of options. From the creamy, decadent Nutella, to the crunchy, sweet butter sprinkle, there’s a treat sure to please the pickiest of eaters. 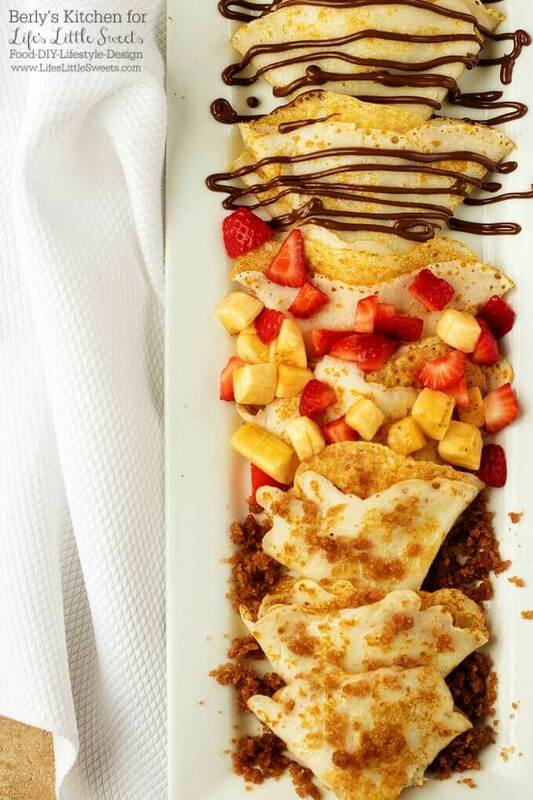 Best of all, once you master the crepes, the possibilities are endless. 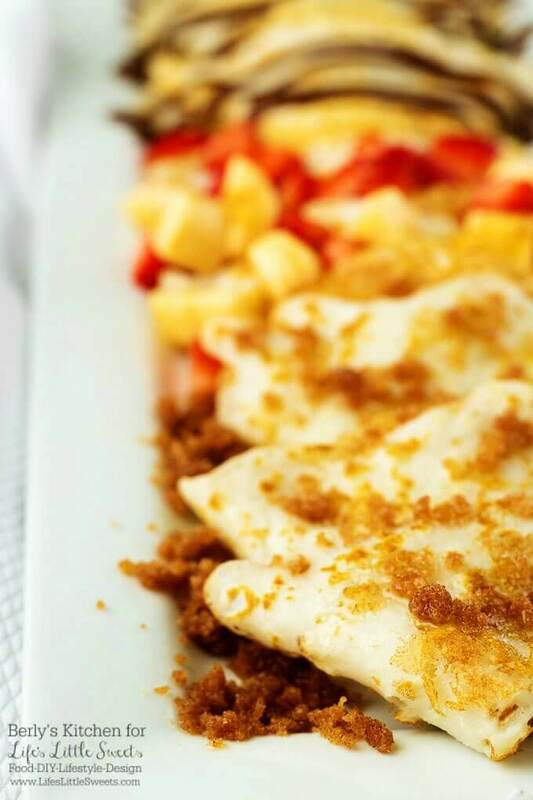 They can be filled with savory or sweet fillings; the choice is up to you. In closing, I want to wish everyone who reads this post, a long life, love everlasting, and a tummy full of delicious breakfast pancakes. Want to see more of our breakfast recipes? Click here for a list of our morning-time favorites. There's no arguing crepes are a popular food. However, people are passionate about their favorite fillings. Here's a variety of options sure to satisfy. The calorie count listed in an approximation based on all the ingredients. 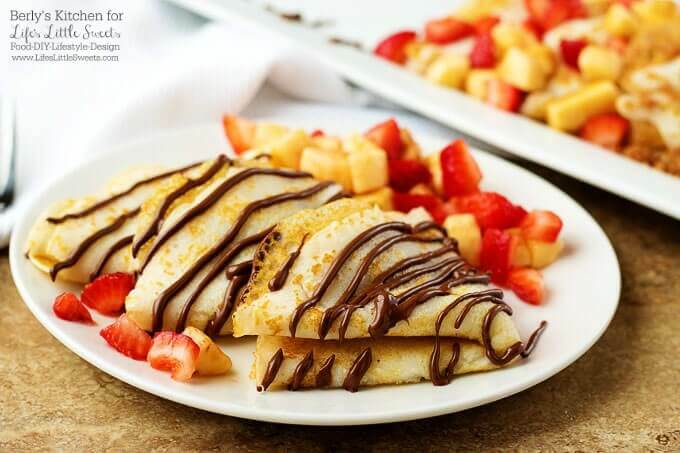 Actual calories will vary by serving size based on which crepe variety is eaten. A serving size is equal to approximately three crepes. Storage of the dish is not recommended, serve while hot. Be sure to sign up for the Life’s Little Sweetse-mail newsletter for more updates and FREE recipes! 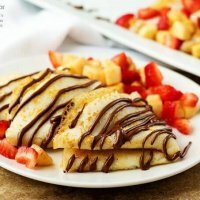 How would you customize this crepes recipe? Please let me know in the comments below! Thank you. I'm John and I am the co-owner of Berly's Kitchen, a blogger, virtual assistant, recipe developer, and business manager. I have several years experience working in the restaurant industry, as well as, the business management and customer service fields.